'Ruby Eruption' (Chuck Chapman, R. 1997). Seedling# 92-100-1. SDB, height 12" (31 cm), Midseason to late bloom. Standards bright yellow ground heavily marked dark ruby red; falls yellow ground lighter near beard, dark ruby red plicata edge, narrow yellow outer rim; beards cream, hairs tipped dark orange red; ruffled. 'Rusty Dusty' X 'Chubby Cheeks'. 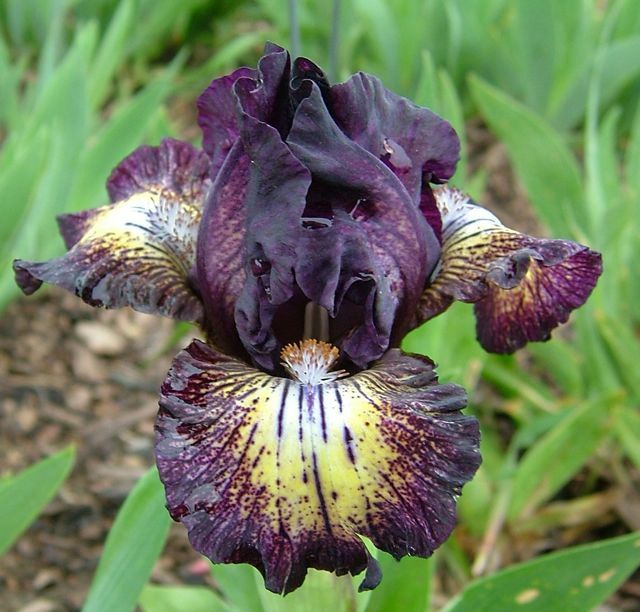 Chapman Iris 1997. Honorable Mention 2000; Award of Merit 2002; Cook-Douglas Medal 2006.
jpg BHP_5228-X2.jpg manage 216 K 11 Feb 2016 - 07:43 BrockHeilman Please contact Brock Heilman for image use. JPG rubyeruption05.JPG manage 71 K 01 Jun 2014 - 15:51 Main.TLaurin Photo by Don McQueen,London, Ont. Canada Zone5.